Want an upscale place to stay? Try the Oliver Inn bed & breakfast, 630 West Washington Street, South Bend, IN 46601. Contacts : (574) 232-4545; www.oliverinn.com ; oliver@michiana.org and tell them the Michiana Brits sent you! 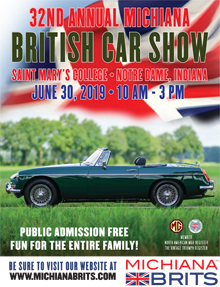 The Michiana Brits British Car Enthusiasts Club invites you to join them at their Michiana Brits 32nd Annual British Car Show. This highly popular all-marque show is on the beautiful campus of Saint Mary’s College on the north side of South Bend, IN, across the street from the University of Notre Dame. Judging will be by popular vote, with awards given for each class and Best in Show. The entry fee is $23 per vehicle, and for club members who have their Michiana Brits membership affiliated with their NAMGBR membership, the fee is $10 per vehicle. Vehicles may arrive after 8:30 AM, judging from 11 AM - 2 PM, awards shortly thereafter. The Featured Marque is the MGB/C/GT Chrome Bumper. Goody bags and collector show pins for the first 100 vehicles. Food sales (credit cards accepted) rain or shine, by Saint Mary’s College, air-conditioned indoors area. Open to the general public 10 AM - 3 PM, free admission & parking, indoor restrooms. Bring a can of food for our “Help Michiana Brits Drive Out Hunger” donation to the Food Bank of Northern Indiana. Entrants may register at the show or pre-register at the Michiana Brits website, www.michianabrits.com. Pre-Register now to take part in the show, or you may register at the show. No 2019 Online Pre-Registrations after Monday, June 24th. Online Pre-registrations will be closed after the 24th, but you may still register at the show.